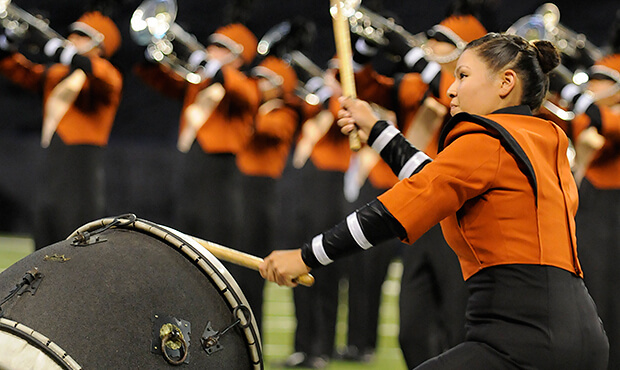 Mandarins finished in 20th place at the 2011 DCI World Championship Semifinals in Indianapolis, just five hundredths of a point under Teal Sound, a corps Mandarins had outscored at the previous five contests. The California corps' show, "The Forty Thieves," told the story of "Ali Baba and the Forty Thieves" from "One Thousand and One Nights." These were the stories told by the legendary Persian queen "Scheherazade," the same character upon whom Santa Clara Vanguard's 2004 and 2014 productions were based. The Ali Baba story is the best-known folk tale among most versions of "One Thousand and One Nights," often known as "Arabian Nights." It's a collection of stories and tales across several centuries from many Arabian cultures, compiled during the several-century-long period known as the Islamic Golden Age. This is the collection from which we get the tale of Aladdin and his magical lamp and the fantastic stories of Sinbad the Sailor. Rather than rely on classical music, Mandarins based their version on the Middle Eastern-infused music by the Israeli percussion group PercaDu. Adi Morag established the duo in 1996 with fellow percussionist Tomer Yariv. During the production, the Mandarins' color guard played the part of the hero Ali Baba while other sections played the part of the thieves. The opening music was from Morag's "Octabones," the 1998 work that won the Percussive Arts Society's Composition Contest in 1999. It has since become a standard in the marimba duo repertoire. The title is derived from the eight-tone musical scale known as an octatonic scale, which theoretically can be any one of 43 possible variants of musical intervals. In the original composition, the two marimbas are set up facing each other, with each marimbist required to play on the other's instrument while reaching across his/her own. Female color guard members were attired as Arabian princesses, and with dark blue flags suggesting the time of dusk, the show opened with exotic hand drumming followed by a loud and boisterous brass fanfare. This led into the opening of the marimba duet, while the percussive melodic lines were transferred to the horns. The entire opener, essentially based on a repetitive six-note ascending figure, conveyed the sense of adventure. The following ballad was based on the gentle marimba ballad that provided the tension release in the middle of the original composition, leading back into the intense piercing melodic jabs that led up to the final resolving major chord at the end of the marimba source material. This same chord ended the field version with a lead-in and resolution by the front ensemble percussion. The next piece was "Spices, Perfumes, Toxins!," a 2006 percussion concerto written for the two PercaDu percussionists and symphony orchestra by Avner Dorman, an Israeli composer who teaches composition at Pennsylvania's Gettysburg College. According to the composer, the title refers to "three substances that are extremely appealing yet filled with danger," making the music most appropriate to convey the danger of the Ali Baba story. The first movement, "Spices," is inspired by Indian and Middle Eastern musical scales, interspersing the marimba outbursts with intervals of jazz and rock motifs from the orchestra. On the field, the horns took the part of the orchestra, taking a dominant role in the production, whereas in the original, the orchestra melody was rather subservient to the musings of the two marimba players. "Perfumes" was a much slower movement. The color guard members brought out solid colored flags of green, pink, yellow, and blue, each representing a different poisonous flower. Much of this movement was based around the tinkling of the mallet instruments of the corps' front ensemble. "Toxins" was much more rhythmically perilous, alternating sections of drumming with bursts of orchestral frenzy. The battery percussion section opened the movement with the segment that in the original featured a battle between one member of PercaDu performing on a pod of low pitched drums, and the other member rocking out behind a pod of higher pitched drums with cymbals, creating a standing version of a drum set. This segment was largely transcribed verbatim for Mandarins' battery percussion section. All flags at this point in the production were peachy yellow, a color intentionally less visually comforting than the four colors of the previous section as the impending end was to be violent and fatal. At the climax of the finale, a lone guard member ran through the corps, trailing a long red banner representing the poisonous toxin of the deadly flowers in the garden. All members of the horns and battery percussion fell to the ground, stricken by the deadly toxin that swept through the band of thieves, with the sound of wind all that remained on the field. The guard members, playing the part of Ali Baba, stayed safely away from the poison and looked on with a bemused look as if thinking, "Well, I won't need to be dealing with them anymore." For this week only, you can save on the DVD that contains this complete Mandarins performance, along with all of the World Class corps on the 2011 Vol. II DCI World Championship DVD. Buy the 2011 Vol. II World Championship DVD. (Available this week only for 20% off. Regular price: $35.95.) Discount DVD offer ends Monday, Aug. 25, 2014.